Thomas Jefferson cultivated a taste for fine foods and wine while serving in diplomatic service in France between 1784 and 1789. A connoisseur of wine, which he described as �a necessary of life�, he stocked his own cellars at Monticello with wines from France, Portugal, Spain, Hungary, Germany, and Italy. In his personal memorandum books, Jefferson recorded many purchases of glassware between 1767 and 1821. Among the few surviving pieces are two lead-glass flutes decorated at the rim with a band of sprig and oval wheel-cut engraving. The glasses were probably made in England in the late eighteenth century. 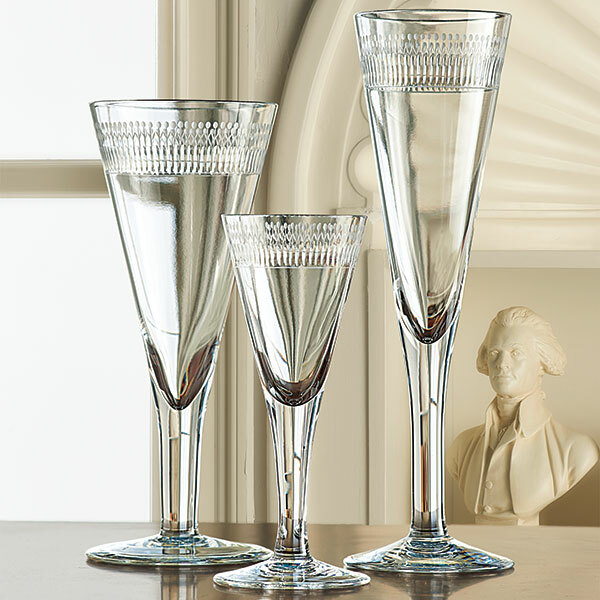 Monticello Stemware is developed from one of the wine glasses currently in the collection at Monticello. 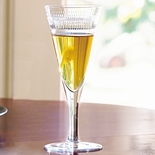 The cordial glass is a reproduction; the wine glass and champagne flute are adaptations of the original. All three glasses are full lead crystal. These mouth-blown glasses are cut and etched by hand in the same manner as the originals. The individual variations that appear in these pieces are the hallmarks of hand-blown glass.